After six years of being without one of Dharish’s delicacies, and after a recent rendezvous in the mother country, I was determined to magic up Dharish’s “secret” recipe. Except now that I’m telling you, it’s not so secret. Just keep it under your hat, ok?! 1. Place spices, garlic, onion, ginger and olive oil into TM bowl and chop for 6 seconds on speed 6. 2. Scrape down sides of bowl and sauté 5 minutes on Varoma on speed 1. 3. Add tomatoes, tomato paste and potatoes and cook for 15 minutes at 1ooC on reverse speed 1. Check that potatoes are done. 4. Add the chicken to the TM bowl and cook for 7 minutes at 100C on reverse speed soft. 5. Allow to rest for about 10 minutes in a Thermoserver. Serve garnished with coriander leaves with some rotis or steamed rice. 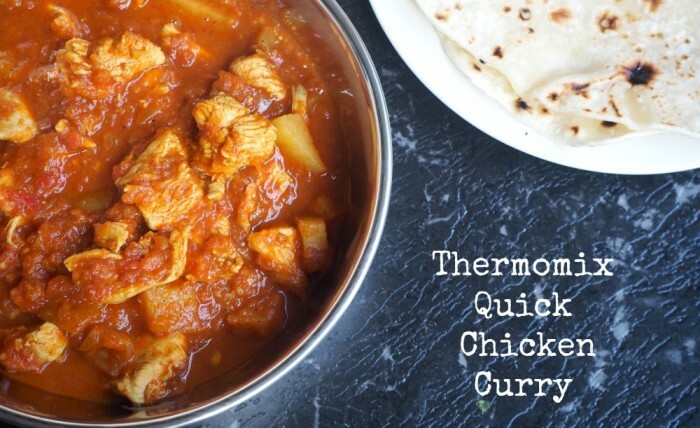 Dharish recommends using chicken thighs in this recipe because it’s so tender and juicy but if you prefer using chicken breast, reduce the cooking time for the chicken to 5 minutes.